Two otherwise sane men have decided to walk from Lands End to John O'Groats (LEJOG) by the scenic route, which is over 1,200 miles. Our names are Doug Kennedy and John Drinkwater. Doug is carrying a guitar strapped to his pack and playing music at stops on the way. We are raising money for Precious Lives (a Cornish charity to improve hospice facilities for children in the county). We start at Lands End on Sunday April 5th, which is Doug's 60th birthday and two days after John's 60th birthday, and hope to arrive at our destination within 2 months. We will have to average about 20 miles a day. 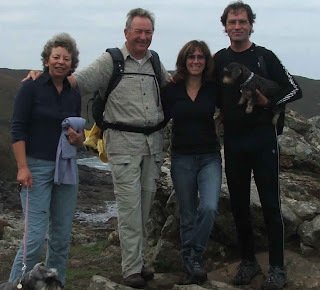 This picture, taken near Lands End on another walk is of Yolanda, who is married to John with Vicky at her feet, John, Lindsey, who is married to Doug who is on the end holding Daisy, our dog. Creative, energetic, too many interests, I've been a teacher, a musician, writer, music publisher, financial adviser (! ), systems analyst and developer, environmental lobbyist and am qualified in most of the above. If only I'd found my proper career. 2 sons in their 20s and got married for the 2nd time (a surprise to me too) in May 2008 - very happy.